If you ever have the urge to experience what it's like to travel at 100 MPH while at the wheel of a well-tuned, high performance sports car, then you have a couple of options. You can either put the pedal to the metal on the freeway (which we do not recommend, unless you also have the urge to experience jail), or you can become a professional race car driver. 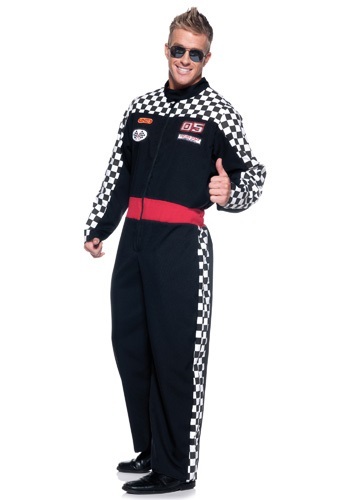 If you'd rather just look like you have driven that fast, then dressing up in this sleek Race Car Driver Costume is the way to go! It may seem surprising, but becoming a pro race car driver takes more than throwing on a crash helmet, jumping into a mid-size sedan, and driving around in circles with fifty other people. It's a tough job! It would be like driving in rush hour traffic for a couple of hours a day, except with thousands of people watching from bleachers (and absolutely no bathroom breaks). But if you've got the right moves, being behind the wheel can be pretty exciting, no matter what you're driving. Whether a speedy coupe, a sturdy SUV, or a sensible minivan, any vehicle will feel like a high performance stock car once you throw this outfit and some aggressive “vrooming” into the mix! Speaking of vrooming, you won't be able to stop yourself from doing it while in this jumpsuit. The checkered detailing and sewn-on patches look like the real deal, and adding some sporty sunglasses and driving gloves to this costume will give you the look of a steely nerved pro! Just remember to not actually drive like one while you're wearing them. Nice, but the quality is quite poor. The sizing was all wrong. Had to return it. My bf could get into it but couldn’t get the seam of the seat from wedging into his bottom. The legs were short and not flattering. He’s an average sized man so this was disappointing.